Composed by Trad. Tune with Arrangement and Lyrics by Mary Kay Aufrance. Early Music, Celtic, St. Patrick's Day, Fairy Tales. Set of Parts. 3 pages. Published by Mary Kay Aufrance (S0.132877). Singer songwriter Mary Kay Aufrance wrote the beautiful fantasy lyrics for The Lark in the Morning traditional Irish tune; because, she read the legend of the tune's lost lyrics. "Somebody wrote to me asking if I knew the lyrics, so I decided that this tune should not have to go without lyrics any longer." In this song, faithful to folklore, the Lark "flies into the sun" as it sings a mysterious song. "And if I am lucky, she'll sing it for me." 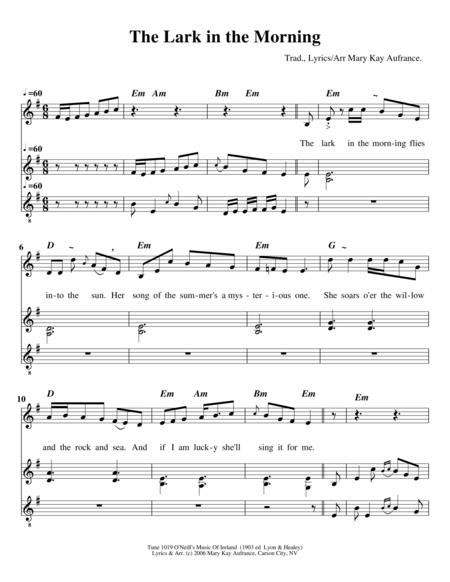 This 3-part all treble clef and vocal arrangement ofLark in the Morning is suitable for small ensemble or soprano, alto or tenor vocal performance with accompaniment. Chord names are included. This is the well known public domain Irish waltz #1019 found in O'Neill's Music Of Ireland (1903 edition Lyon & Healey). According to folk music legend, the tune had original lyrics that did not survive the oral tradition, due to never having been written down, and therefore the original lyrics remain lost to all time. Musicians who play this arrangement call it "beautiful." 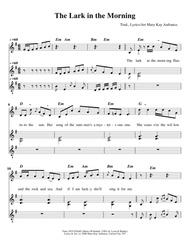 This score suits string quartet or other treble clef melody instruments such as recorder, flute, accordion and mandolin plus vocals or another treble clef instrument, as illustrated on the .mp3 sample file. This arrangement debuted at an outdoor summer concert at the Brewery Arts Center in Carson City, Nevada, performed by Silver Strings Quartet chamber group and Gairin Celtic's Music Tom and Mary Kay Aufrance. At the debut performance, musicians played it on violin, voila, cello, flute, accordion and guitar, with Mary Kay singing. Add The Lark in the Morning to your St. Patrick's Day program. Suitable for all ages and school programs. Thank you for considering this score for your sheet music purchase.